The Party's On At The 10th Annual Low 4 Life C.C. Fall Slam. 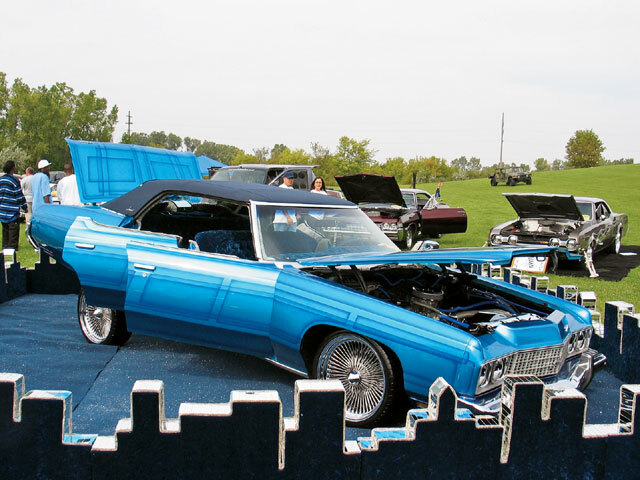 Great Lake area lowriders helped Low 4 Life Car Club celebrate its 10th annual Fall Slam at the Buena Vista Community Center Park in Saginaw, Michigan, this past September. More than 250 cars showed up to the two-day event and there were some 2,500 people in attendance. Great weather contributed to clubs and individuals coming in from all over for this outdoor event, which included live entertainment by Chingo Bling, DJ Flexin’ Frank, DJ TCT, Sub T, Isaac Y Dani, Tony Kappo, Triple Threat, Pangea and Mobstyle Hustlers, as well as Club 93.7 who showed love on the radio. Since this was the 10th annual Fall Slam, the guys with Low 4 Life wanted to do something special and offer the Midwest one of the best shows in the region. Low 4 Life experienced the unexpected passing of two of their members-Joshua Miguel Garcia and Matt Amon-prior to the event and dedicated the show to them. 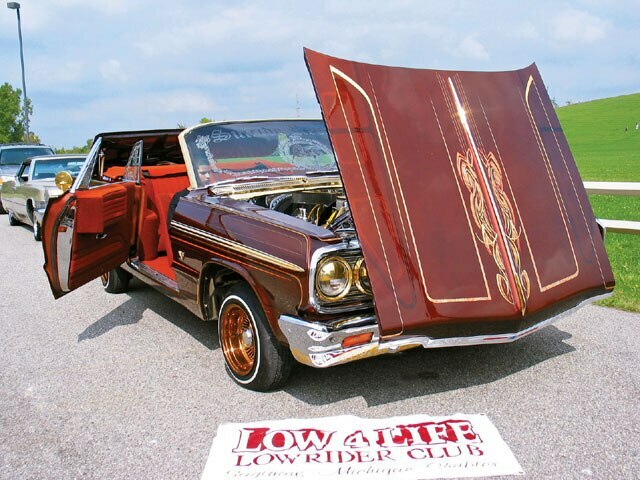 Joshua was the five-year-old nephew of club president Alberto Garcia and member Lee Perez, and he enjoyed going to shows and parades in a lowrider with his “Uncle Pido” and “Uncle Lee.” Matt was a club member for six years and was always ready to ride for the cause. Both will be remembered as true Low 4 Lifers. The trophy presentation was a little different this year as they took the presentation indoors and had a slide show honoring everyone who attended and supported the event. Special award winners included City Limits C.C. for Club Participation and Tommy from Show ‘N’ Go for Best of Show for his ’64 Chevy Impala. Tommy also came out on top in the Car Hop, with fellow Show ‘N’ Go guy Bill taking the Truck Hop and Truck Dance. Best Car went to Fred, “Da Game,” Best Truck to Tony Martinez, Best Sub-compact to Pat Rapin and Elias Noriega pedaled home with the Best Bike award. Low 4 Life club members also presented a specially engraved custom crystal clock as a token of appreciation to the president and “first lady” of the past 10 years to Alberto “Pido” and Victoria Garcia for all of the blood, sweat, tears and money that they have both put into the club. The club believes that they’re the heart, soul and backbone of Low 4 Life. Alberto and Victoria responded by saying thanks and God bless to all of the clubs and individuals who came out to support the event. They promise that this year’s 11th annual Fall Slam will be bigger and better, and will continue to exceed everyone’s expectations! Tommy nailed the back bumper from the switch on the door. 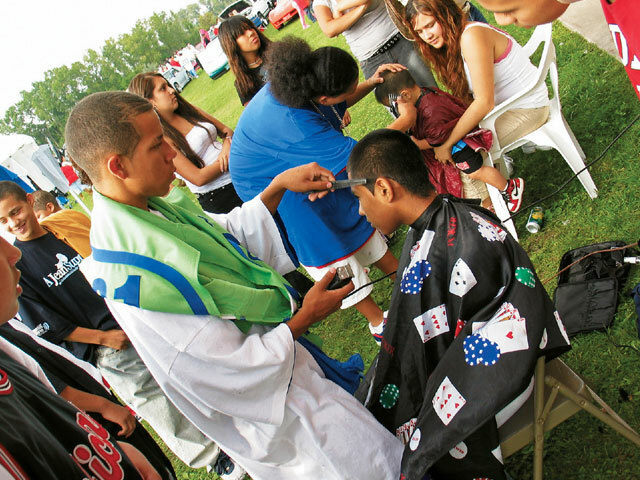 There were custom haircuts to go along with the custom cars at the show. 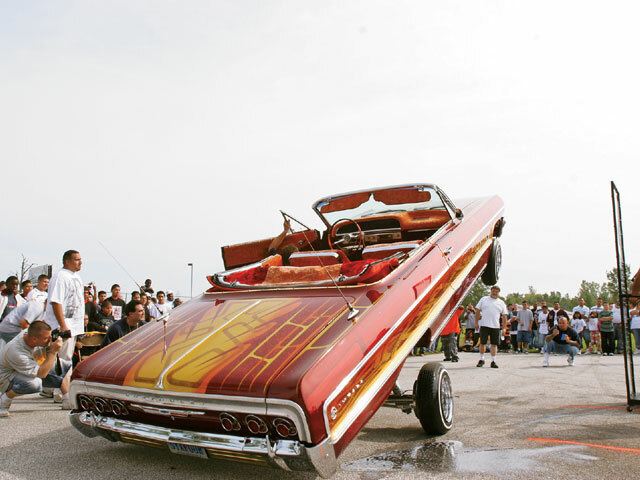 This old school Impala was laying low to show the new school how it’s done. 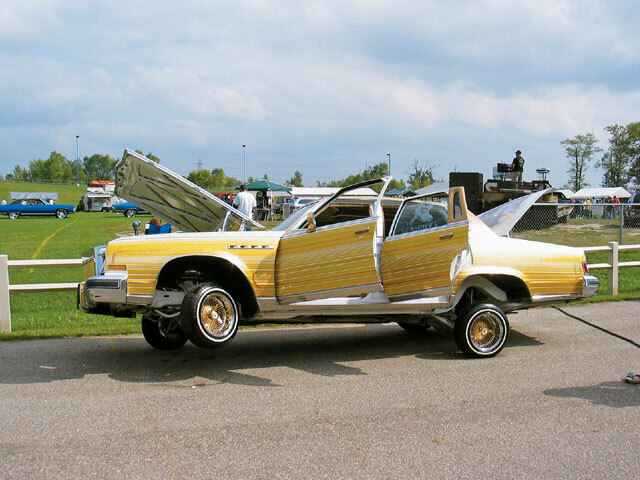 This clean Regal had that gangster lean and three-wheel motion. 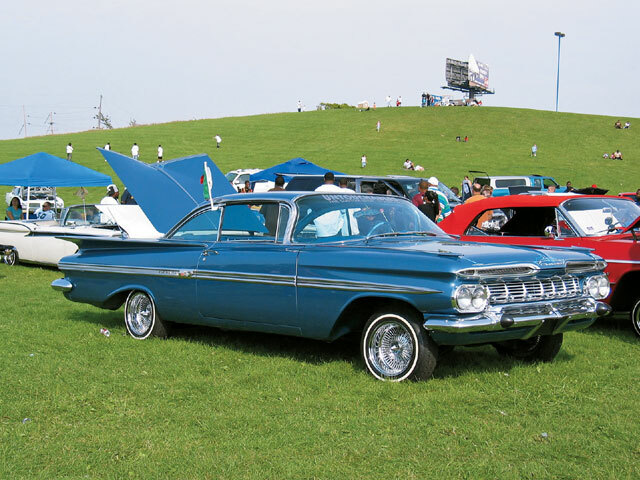 Toyo’s customized ’64 Impala was among the 250 fine rides on display. 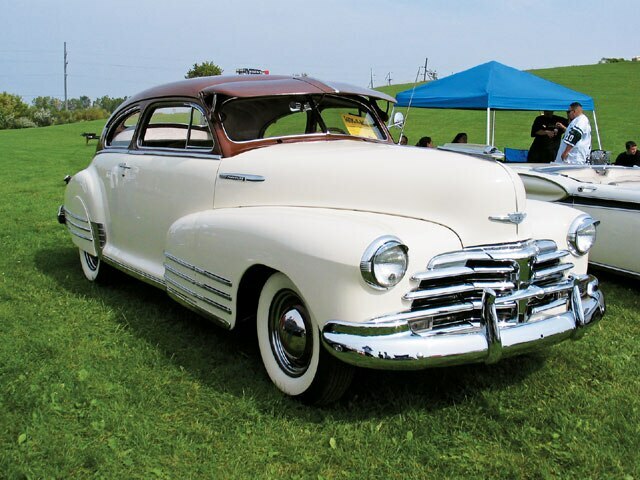 This fine Fleetline shows how they used to make ’em in Michigan. 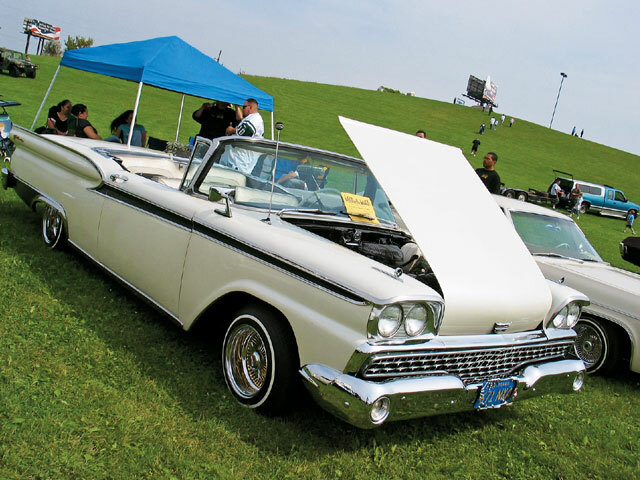 This ’59 Galaxie ragtop could’ve been featured in our Ford special. Albert and Victoria chill for a quick snapshot. Blue paint with graphics and oversized chrome wires work well for this Impala. 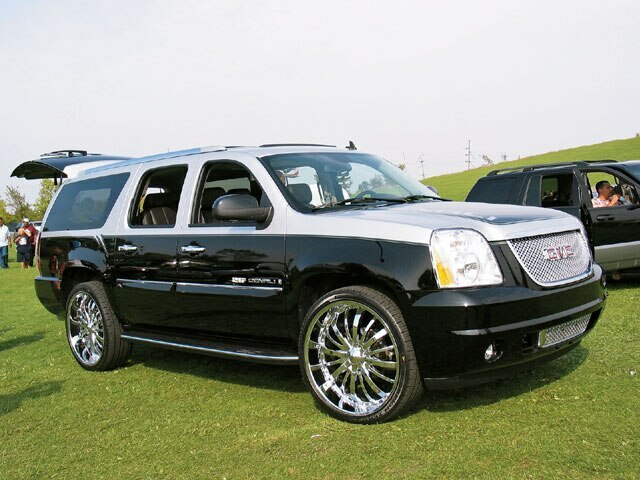 This ’07 Denali was the first hooked-up one that we’ve seen. 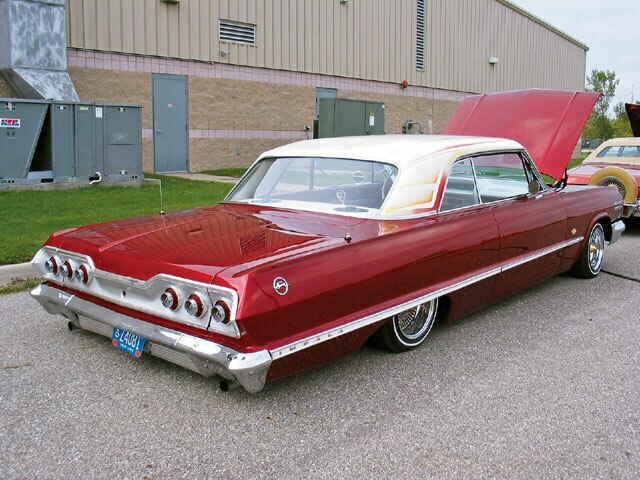 We took a shine to this beautiful ’59. Nothing but Good Times with this Detroit Regal.